In the wake of another deadly mass shooting, politicians, victims, and advocates are calling for reforms to America's gun laws - but proposals to expand background checks or ban certain types of guns typically don't get very far. President Donald Trump and other Republicans have said efforts to prevent future mass shootings should focus on mental health and a new ABC News/Washington Post poll found that 77 percent of Americans say better mental-health monitoring and treatment could have prevented the shooting in Parkland last week. But research does not support a link between being diagnosed with a mental health disorder and an increased risk of committing a violent crime, according to experts in the field. Daniel Webster, director of the Center for Gun Policy Research at Johns Hopkins University, said that talking about "mental health" alone is way too broad. "Mental illness when you think very broadly affects nearly 1 in 5 adults, it encompasses so many different things and its way too large of a net to cast to say everybody with a mental health problem is violent or likely to be violent," he said Tuesday. Current federal regulations say that anyone who has been involuntarily committed to a mental institution or found not guilty of a crime by reason of insanity cannot legally possess a firearm. Fewer than 5 percent of gun-related killings between 2001 and 2010 were committed by people diagnosed with a mental illness at the time, according to a 2015 National Institutes of Health article. Webster said that while there have been some cases of people with a mental illness committing mass shootings — and have received heightened attention in the media and by lawmakers — that doesn't mean everyone with such disorders are more prone to commit those types of crimes. Past behavior is a better predictor of whether someone will be violent in the future, he said. As a result, it would be difficult to create a policy solution that would predict who could commit a violent crime like the mass shooting in Parkland last week. "Let's improve access to mental health care, let's improve access let's do that, let's get troubled kids access to the services they need," he said. "But lets not fool ourselves that, one, its going to be easy or two, that its going to solve the problem." Despite the president's comments that mental health is a problem, one of his earliest actions after taking office was to undo a regulation that would have made it more difficult for people with a known mental illness to buy guns. Nearly a year ago, on Feb. 28, 2017, Trump signed H.J. Res. 40, effectively ending the Social Security Administration's requirement that the names of people who receive mental health benefits be entered into the National Instant Criminal Background Check System. This is the database the FBI uses to determine who is able to purchase firearms. Florida Republican Sen. Marco Rubio said on the Senate floor Thursday that assault weapons bans didn’t work in the past and wouldn’t work now because there are so many guns already on the street. “You could pass a law that makes it hard to get this kind of gun in a new condition. But you are going to struggle to keep it out of the hands of someone who has decided that’s what they want to use because there are so many of them out there already that would be grandfathered in,” Rubio said. The United States boasts the highest number of civilian firearms per capita - 270 million, or 89 guns for every 100 residents, according to Small Arms Survey research published in 2011. By comparison, Canada has 31 guns per 100 residents, Mexico has 15, and China has five. 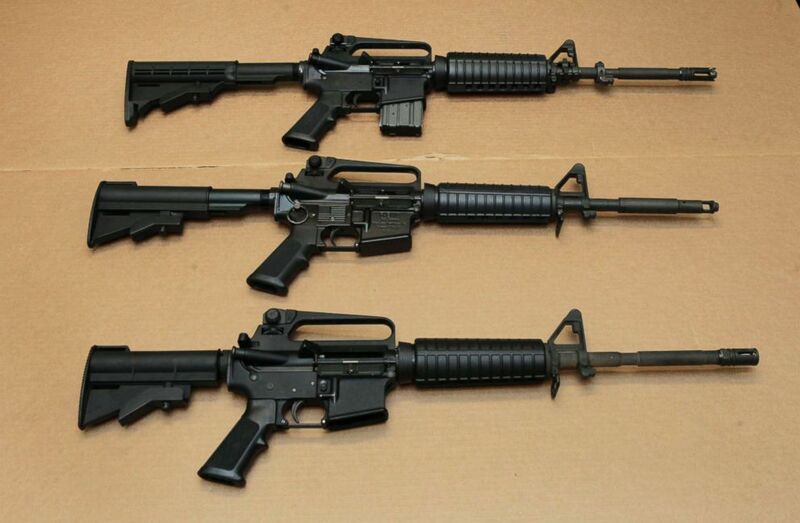 Three variations of the AR-15-style assault rifle are displayed at the California Department of Justice in Sacramento, Calif., Aug. 15, 2012. Data from professor Michael Siegel at the Boston University School of Public Health suggests that states with a higher percentage of households with guns also tend to have higher-than-average gun homicide rates. Webster said that the idea that people will always be able to get guns is common because the nation is inundated with news about crimes committed with guns. But such storylines can be misleading. "You can always find people that will go to great lengths to get their hands on a gun and carry out what they want to do," he said. However, research shows that people who commit violent gun crimes do so with weapons that they already had available, he said. Most of these crimes are impulsive. Some lawmakers have declined to answer questions about the gun control debate in the immediate aftermath of tragedies involving guns because they say it is insensitive to victims and their families to discuss politics so soon after people have been shot or killed. However, in the immediate aftermath of last week’s shooting students and other survivors have been outspoken about the need for action to prevent future mass shootings and have urged lawmakers to reform gun laws. Students from Marjory Stoneman Douglas High School traveled to the Florida capitol Tuesday to meet with state lawmakers about gun reform and some are scheduled to come to Washington, D.C. to participate in roundtable discussions at the White House. They have also announced a march on Washington, D.C. next month to call on Congress to act on gun reform. The president announced Tuesday that he has directed Attorney General Jeff Sessions to draft a rule regulating bump stocks and the White House said several other possible approaches to regulating guns will be discussed in the coming days. In mass shootings in public places — so called "soft targets" , the conversation often turns to whether churches, schools, or other places where large groups of people gather need to increase security to prevent future incidents. Education secretary Betsy DeVos told conservative radio host Hugh Hewitt that states clearly have the option to allow teachers to carry guns on campus in an effort to stop future shootings. "I think this needs to be part of the broader, more robust conversation about how can we avoid these things in the future, and how can we ensure that when my child, your child, goes to school in the morning, they're going to go to a safe and nurturing environment," DeVos said. 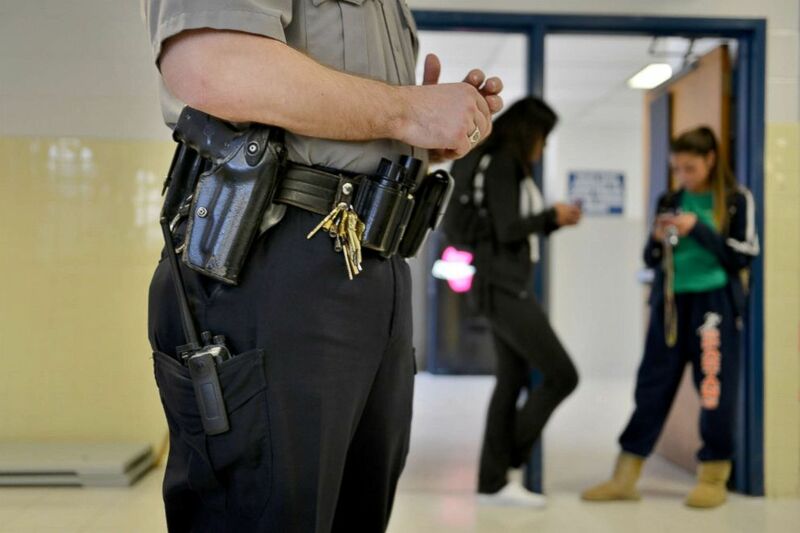 Officer Joe Plazio, of the Fairfax County Police Department, stays armed with his service pistol as he patrols the school where he is stationed at West Springfield High School, Jan. 18, 2012, in Springfield, VA. But Webster said that it would be a very expensive proposal to arm teachers in every school and that it would mean there are a lot more guns in schools on a daily basis. "You're putting lethal weapons in a lot of environments and everything we know about increasing access to guns particularly in environments that intersect with youth that generally that's a recipe with disaster," he said. The Second Amendment is often a flash point in conversations about whether the federal government should, or even can, move to restrict access to guns. After the Las Vegas shooting last October, Reps. Seth Moulton, D-Mass., and Scott Taylor, R-Va., spoke with “This Week” co-anchor Martha Raddatz about different interpretations of the role of the Second Amendment in reducing gun violence. Moulton, who served four tours in Iraq while in the Marine Corps, said more “reasonable restrictions” are allowed under the Second Amendment, comparing restricting guns to restricting tanks or land mines. According to the Second Amendment, "a well regulated Militia, being necessary to the security of a free State, the right of the people to keep and bear Arms, shall not be infringed." Critics argue that the Founding Fathers envisioned an armed militia, not necessarily a population of armed private citizens. But in 2008, in a 5-4 decision, the U.S. Supreme Court declared owning firearms an "individual right." Writing for the majority Justice Antonin Scalia argued, "It is clear that the Framers . . . counted the right to keep and bear arms among those fundamental rights necessary to our system of ordered liberty." He also rejected the argument - which he said "bordered on the frivolous" - that the amendment should only apply to the types of weapons in existence during the drafting of the Bill of Rights. However, the Supreme Court acknowledged that just as the First Amendment does not protect the right to speak for any purpose (for example, people can't yell "fire" in a crowded theater), the Second Amendment does not protect the right "to carry arms for any sort of confrontation," and upheld the government's authority to abridge access to weapons that wouldn't be used for a lawful purpose. While the Second Amendment could pose a legal hurdle to any federal reform of gun laws, some states have made changes such as increasing the minimum age needed to buy an assault rifle. Trump says he is working with Congress on a proposal that could address some factors that led to last week's shooting. He announced Tuesday that he has directed the Department of Justice to draft a rule that would ban bump stocks and other devices used to turn legal weapons into machine guns. Press secretary Sarah Sanders said Monday that the president supports efforts to improve the background check system. The president spoke with Sen. John Cornyn, R-Texas, about a bill Cornyn has co-sponsored with Sen. Chris Murphy, D-Conn., that aims to ensure that the background check system has up-to-date and accurate information on individuals prohibited from buying firearms under federal law. That bill has been endorsed by the National Rifle Association and other gun rights organizations. Sen. Dianne Feinstein and 25 other Democrats have sponsored an assault weapons ban bill that would also ban high-capacity magazines, but it has not moved forward in the Senate. Webster said that research indicates there are other policy solutions that would help reduce violent crime. He said there is strong evidence that banning people with restraining orders for domestic violence saves lives so lawmakers could make it easier for family members to get an order of protection if their loved one is talking about engaging in violence or amassing an usual amount of weapons of ammunition.